Online retailers and merchants who are launching or running an ecommerce campaign are certainly on the right track. With more and more consumers conducting their product research and purchases online, having an online store has become a definite must for retailers. However, it’s not enough to simply have an ecommerce presence. The importance of videos in ecommerce is something that can no longer be denied. In fact, there have been plenty of research to prove consumers’ emerging preferences towards videos. For instance, according to Cisco Systems, approximately 40% of internet traffic consists of users searching for and watching videos. And this number is predicted to increase even more by 2015. Another report by Simply Measured shows that Facebook statuses that feature an interestings video are more likely to be shared by users rather than statuses that only contain text. According to another study conducted by Marketing Week in April 2013, 16% of visits to ecommerce sites that contain quality videos lead to a purchase. If you want to be one of the retailers using videos in ecommerce then it’s important to keep in mind that integrating videos into your site will need to be done properly. A low-quality video that fails to load or loads slowly is more likely to harm your ecommerce reputation rather than enhance it. Read on to learn more about how to use videos in ecommerce by retailers. Unless you’re a film expert or a you run a movie studio, then it is highly recommended that you outsource your ecommerce video. Although you will need to pay more than you would if you just make the video in-house, it will definitely be a good investment since an expert will be able to make HD videos that can also be accessed through different platforms, such as smartphones and tablets. Retailers should not just rely on video content to attract more customers. It goes without saying that your overall ecommerce site should be enhanced as well. Placing a high-quality video on a poorly designed website is like putting brand new pretty accessories on dirty and unwashed hair. Using ambassadors to endorse your products is an age-old marketing tactic that you should consider using on your ecommerce videos. If you have a large budget, then you can even hire a local celebrity or a well-known personality to be your brand ambassador. Having people in your videos create a human connection that consumers are more likely to trust. As mentioned earlier, a large part of internet users love to share videos with their contacts. Therefore, it’s important to give your users the option to share your videos through various social networks, such as Facebook and Twitter. Having users distributing or sharing your ecommerce video is similar to having free advertising. Another benefit of using videos in your ecommerce website is that a video has much more marketing potential aside from being just a video. For instance, after you’ve managed to put together an excellent HD video, you can take high-quality still images from the film or build other apps around it. Even if you have an expertly made video and the most popular ambassador promoting your product, your video is still likely to fail if it doesn’t appeal to the viewer on an emotional level. Therefore, don’t just focus on the technical aspect of the video; make sure you also invest in a good script and story that will register emotionally and personally with your viewer. Ecommerce videos increase chances of purchases, boosts your SEO, promotes your product through user distribution and enhances your overall marketing. 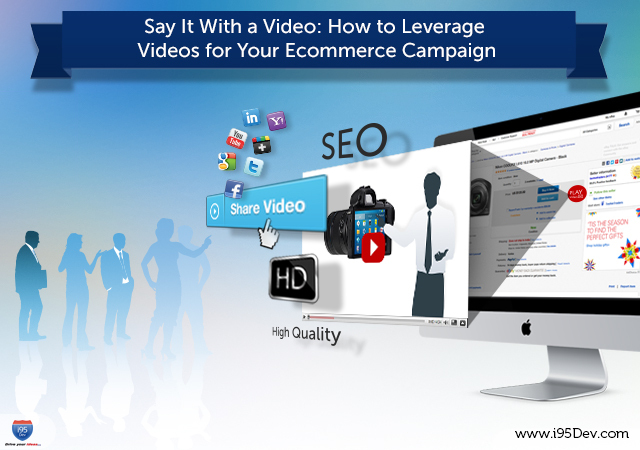 If you’re sold on the benefits of videos in ecommerce, then i95Dev can help you out. Feel free to connect with us through our website at http://www.i95dev.com/contact/or give us a call at 301.760.7499.